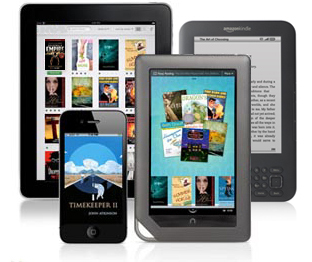 NYSinC’s Programs Return Sept. 18th with the E-Book Revolution! The e-book revolution is here! And you can join it. Come and hear our expert panel—authors who write e-books and the publishers who publish them—discuss the ins and outs of e-publishing. The panel will include writers Rosemary Harris, Judi Culbertson , Tanya Goodwin, and Kate Gallison, who have all had experience publishing both e-book originals and e-book reprints of backlist material. It will also include Lois Karlin, an experienced guide to the e-publishing world. Peggy Ehrhart will moderate. Our chapter meetings have a NEW DAY AND PLACE for the 2013-14 programming season, so be sure to note the change. There’s more information about the Jefferson Market Library and upcoming programs here. Meet and Greet 6:00 p.m. Program 6:30 to 7:45 p.m. The revolution will be read! This entry was posted on August 26, 2013 by nysinc. It was filed under Announcements, Events .